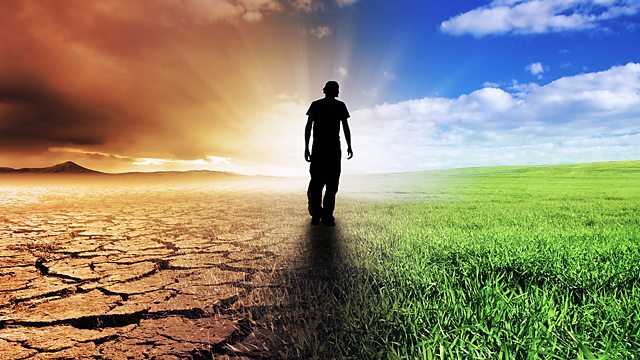 Most think of global warming as being human-made, and while much recent attention to global warming is due to the human-made variety, global warming is actually a natural process as the Earth has experienced natural global warming and cooling many times in the past. The Antarctic EPICA ice core has existed for 800,000 years, and that has included eight glacial cycles with interglacial warming periods that are much hotter than current temperatures. Some geologists believe that a rapid build-up of greenhouse gases caused the Earth to experience global warming in the early Jurassic period, with average temperatures rising by 5 C (9 F.) This caused rock weathering by 400%, which in turn, led to CO2 levels dropping back to normal over the next 150,000 years because rock weathering locks away carbon in calcite and dolomite. Other past global warming events were believed to be caused by sudden releases of methane from clathrate compounds, including the Permian-Triassic extinction event and the Paleocene-Eocene Thermal Maximum. However, the last glacial period was believed to be caused by natural variations in the Earth’s orbit, which led to the retreat of the ice sheets because of the changing amount of solar radiation received at high latitude. However, the recent attention to the topic of global warming is due to the fact that human actions have caused global warming on a scale and with a rapidity unseen before. Global average air temperature near the Earth’s surface has increased by 0.56-0.92 C (0.98-1.62 F) over the last century. The Intergovernmental Panel on Climate Change (IPCC) concludes that this observed increase in globally averaged temperatures since the mid-20th century is very likely due to the observed increase in greenhouse gas concentrations due to such activities like burning coal and fossil fuels, cutting down forests, and overgrazing the land. These activities have increased the greenhouse effect, which in turn, has warmed the temperatures near the Earth’s surface and lower atmosphere. From the period of 1860-1900, global land and sea temperatures had increased by 0.75 C (1.40 F,) but from 1979 to the present day, land temperatures have increased about twice as fast as ocean temperatures (about 0.25 C/decade land temperature versus about 0.13 C/decade ocean temperature.) Also, temperatures in the lower troposphere have increased between 0.12-0.22 C (0.22-0.40 F) per decade since 1979. The hypothesis of man-made global warming was first made in the 1880s, but due to the fact that 19th century calculations predicted that the mean global temperature should have risen by more than 1 C by 1940, and it hadn’t, most had considered the hypothesis as more of a curiosity. It wasn’t until 1979 when Mrs. Margaret Thatcher became the Prime Minister of the United Kingdom that the hypothesis became a major international policy issue. Global warming has continued to be a major international policy issue since 1979, as the Rio Summit in 1992 proposed actions to constrain the emissions and the Kyoto Summit in December 1997 established binding agreements that would commit nation states to the constraints. Europe, Japan, and the United States have agreed in principle to adopt the “Berlin Mandate” that requires them to cut their CO2 emissions to 15% below their 1990 levels by 2010. The US is not totally convinced this is the right approach, however, as the US Department of Energy (DoE) has conducted a study that suggests the “Berlin Mandate” will not reduce world-wide emissions of CO2. In fact, the DoE study suggests that the “Berlin Mandate” could raise CO2 emissions because many energy intensive industries would be forced to leave the US, Europe, and Japan where the constraints are enforced to countries that have either not adopted the mandate or that don’t strictly enforce them, and because those countries likely would have less energy efficient industries, that would likely raise the level of CO2 emissions. The 2000 Democratic Presidential candidate, Al Gore, has brought a new focus on global warming with his 2007 Oscar-winning documentary, “An Inconvenient Truth.” In this documentary, Mr. Gore has offered a passionate and inspirational look at his fervent crusade to expose the myths and misconceptions behind global warming so that global warming’s deadly progress can be stopped before it’s too late. As you can see, global warming has been a hotly debated global topic for nearly the last 30 years. No one is absolutely sure what approach is the best way to go about reducing the threat of global warming in the future. If it’s true that global warming could cause epic destruction in the near future, more discussion, and more importantly, action will need to be taken in order to avert that destruction. Looking at the history of global warming will likely help in determining a course of action that will help us avert that possible destruction.